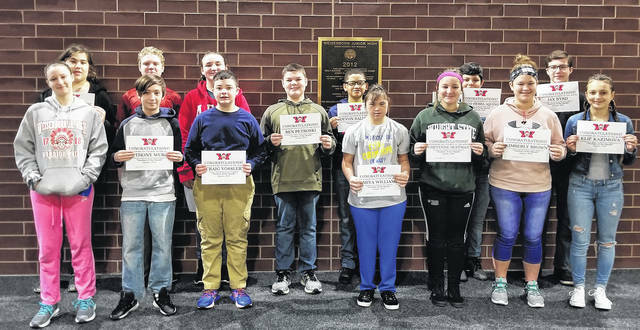 Congratulations to the Weisenborn Junior High School January Students of the Month - Devon Baldwin, Kimberly Brown, Jax Byrd, Diego Herrera Aquino, Cheyenne Huffman, Elif Kazimova, Ashlynn Mandich, Alec McKnight, David Osterfeld, Natalie Page, Ben Petroski, Jonathon Stover, Craig Vossler, Evelyn Wentworth, Amiya Williams, and Anthony Wurst. These students were selected by their teams of teachers for their hard work; being respectful; responsible, and having a positive attitude. The students were treated to a special “Pizza with the Principals” luncheon with Mr. Carey and Mr. McCollum. Congratulations to the Weisenborn Junior High School January Students of the Month – Devon Baldwin, Kimberly Brown, Jax Byrd, Diego Herrera Aquino, Cheyenne Huffman, Elif Kazimova, Ashlynn Mandich, Alec McKnight, David Osterfeld, Natalie Page, Ben Petroski, Jonathon Stover, Craig Vossler, Evelyn Wentworth, Amiya Williams, and Anthony Wurst. These students were selected by their teams of teachers for their hard work; being respectful; responsible, and having a positive attitude. The students were treated to a special “Pizza with the Principals” luncheon with Mr. Carey and Mr. McCollum.